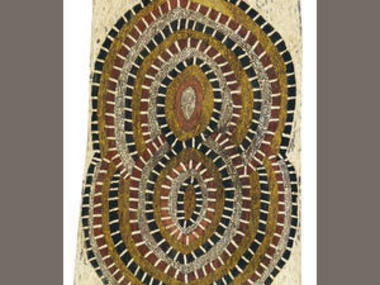 Bonhams May series of auctions held in Sydney produced some fantastic results for Aboriginal art. Although buyers were highly selective passing on many wonderful lots, there was plenty of competition for the most highly desirable and significant works. The highest price for an Aboriginal work of art during the May series went to a large and incredibly beautiful painting by Paddy Bedford titled Thoonbi, 2006 which sold for $180,000. 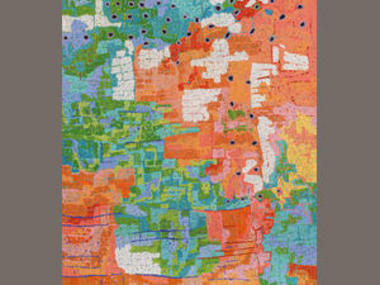 Gordon Bennett’s Haptic Painting Explorer (The Inland Sea) 1993 was the second most expensive work by an Aboriginal artist selling as part of the Fehily Collection for a total of $108,000 to art consultant Annette Larkin who would most likely have been purchasing on behalf of a client. Children's Story by Shorty Lungkata Tjungurrayi from the Superannuation Fund of William Nuttall and Annette Reeves sold for $45,600 just ahead of Emily Kam Kngawarray’s Untitled painting which fetched $31,200. The cover lot of the main Aboriginal art sale, Deaf Tommy Mungatopi’s Coral, sold for $60,000 while a wonderful painting by Clifford Possum titled Warlugulong made $38,400.